Texas A&M’s Ty’Rae Carter had to wait a year for the rematch, but to say it was worth the wait is the understatement of the year. 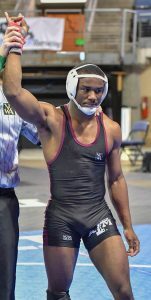 After falling to Zach Blevins of the University of Toledo in last year’s championship match, Carter calmly and coolly exacted his revenge against the same opponent this year, and walked home with the 2019 NCWA National Championship title at 149 pounds following an 11-3 major decision. Carter entered the tournament seeded second behind Blevins. On his way to the championship finals, he took out the fifteenth-, seventh-, and third-seeded wrestlers in the tournament. His quarterfinal match against seventh-seeded Tristan Mabe of the Apprentice School proved to be his toughest challenge before Saturday evening’s championship round took place. “It’s always fun wrestling that team because they keep a full lineup of strong guys.” Apprentice School finished second as a team with seven All-Americans. Carter eeked out an 8-3 victory over Mabe. He hit a filthy throw-by in the first period to quickly go up 2-0. After Mabe escaped and successfully defended Carter’s next single-leg attempt, Carter put Mabe in a side headlock to score another two point takedown. The two returned to neutral, but Carter hit his opponent with a quick ankle pick to go up 6-2, and he never looked back. After cutting his opponent free, Carter was in deep on a double-leg takedown, but his momentum carried him out of bounds before he could score. Carter elected to start the second period from bottom, and he quickly scored the reversal and rode his opponent out for the remainder of the period. Mabe rode tough in the third, but was never able to recover from Carter’s first period thrashing. Carter advanced to face third-seeded Tyler Sage of the University of Florida in the semifinals, who he beat handily 11-3. Sage was the 2018 NCWA National Runner-up at 141 pounds. Carter and Blevins traded takedown attempts in the first period, but neither could finish. Carter’s snap-down to the ankle pick eventually secured him the first takedown of the match before the pair drifted out of bounds. “The first minute and a half was pretty nerve racking,” said Texas A&M head coach Mike Konetski, a former wrestler for NCAA Division I Millersville University. “Blevins is a really talented strong kid. There were two instances where Ty got caught in a front headlock and underhook position, and he got bullied around pretty good. That is what led to Ty on his back the prior year.” Blevins quickly escaped, but Carter came back with the throw-by for another two-point score. After a stalling warning against Carter on top, Blevins appeared to have whipped Carter over to his back upon the restart, but Carter successfully rolled through as the period came to an end. In the second period, the two returned to a neutral position. Carter flurried with a series of level changes, fakes, and head swipes that bewildered his opponent. Carter scored another two points with a snap-down and go-behind, and with nearly one-and-half minutes remaining in the second period, Blevins looked broke. Carter chose to start the third period on his feet, and turned the same flurry of hand motion into yet another snap-down and go-behind. But University of Toledo Coach Bryan Knepper quickly threw the brick for a review of whether Carter put his hands in Blevins face. “During the coaches challenge time, he asked if we were good,” said Konetski, who also volunteers his time at Legacy Wrestling Club in Bryan, TX. “I said, ‘Yeah, we’re good.’ We talked about not shutting down and going into prevent mode. We shifted our focus to securing a major decision.” The call was confirmed – no penalty – and Carter immediately put his foot back on the gas in search of the major. His aggressive pace forced two additional stalling penalties to be called against Blevins. With the addition of the riding time point, Carter locked up the major decision and his first national championship.